A new toy that my super duper Area Team Leader got in. She got one for each of the teachers teaching A level and the arrival date was uncanny. 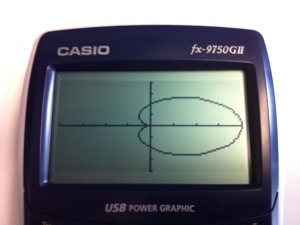 She dropped mine in my classroom the evening before I was teaching sketching polar curves! I thought, “what a handy tool for tomorrow”! And it really was. 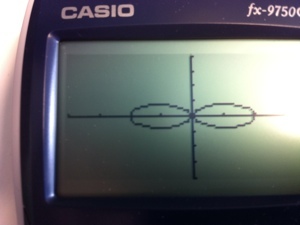 My year 13’s loved playing with it and it was really handy to let them use it to check their sketches if polar curves. I’ve not had chance to play with it much further, but I intend to investigate it’s full capabilities! I’m fairly sure I had this same model (or at least one very similar) when I completed my A levels, so it will be exciting to rediscover what I knew, and to discover many new things about it! If you know of cool uses for it, please do let me know! This week has been a good one. Monday started with the late notice news that my trainee was ill and as such would not be able to teach my year seven class. He had, however, emailled me a lesson he had planned. I taught from his lesson, and he had some good activities, but I didn’t feel as confident teaching the lesson as I do when teaching my own, and i don’t think it went as well as it would have done if I’d planned it. There were things I would have done differently, but a good experience all the same. The rest of Monday was pretty good, and I got the first taste of one of my new y11 groups. (the foundation one). The lesson started a little messy, as some of the pupils felt like they were seen as the “dumber” ones, but we had a Frank discussion about the fact that a smaller group of them targeting the topics they can’t do on the foundation paper gives them the best chance of doing well. They accepted this and hot on quite well. The lesson I has with them on Friday was amazing, they worked really hard and I think they now all want to do their best. My lesson for the rest of the week have gone quite well too, but not as well as Tuesday’s, which might well be my best day since I started teaching! The other highlight of the week was getting to see the school production of Sondheim’s “Into the woods”, but that’s a topic for another blogpost, so watch this space! The first week back after Easter has been pretty hectic, with plenty going on. Not least the GCSE results for the feb/march sitting and the resultant meetings regarding intervention. As a result of this I have picked up two extra year 11 classes and I am looking forward to the increased responsibility this holds for their final half term, and to teaching more of the higher GCSE topics. One of the classes is full of pupils yet to get c’s and the other contains pupils on c’s looking for a’s and b’s. Some of these pupils are looking to take a level maths next year, so improving their grades will be of paramount importance, and teaching them the necessary topics will be fun too! As well as this, a lot of my time this week has been spent working with the ATL on next years timetable for the department. This is a big job that can be frustrating at times, but is something I find fun and challenging. Being strongly maths based is one of its draws for me, and I used a variety of maths techniques to solve various problems, including two way tables and a variation on bin packing. I feel that a generalised solution to timetabling problems is achievable through maths, but would probably be a doctorate level procedure! (Perhaps I will attempt this on day when I have time…) It took us a while, but we managed to work it so the teachers we wanted were on the target classes and that all staff had a good, mixed timetable across a range of years and abilities. I’ve also started work on a KS5 SoW. We haven’t really had one before, we’ve just done medium and long term plans between us and that’s been working ok. But I want to get a more substantial SoW up and running as we are expanding our a level offer and hoping to increase the take up by a lot over the coming years. We have had a year 13 AS Further Maths class this year and we have added a full A level Further Maths to the year 12 offer for next year. The SoW will also take into account what topics are needed from A level maths to enable pupils to complete the further pure module and ensure these are completed first in their A level maths class. My personal highlight this week was in a year 13 further maths lesson, after teaching MacLaurin’s expansion I asked, “can you use this to prove Euler’s Formula?” The class managed it with no input from me! There are a few things that have been at the forefront of my mind recently, and I thought I would write a post about them here and see if anyone can add anything. The first is the question of Abacuses (or Abaci? I don’t know the correct pluralisation). Having a 9 month old daughter has meant that invariably I have spent rather a lot of time in toy shops/mothercare/the early learning centre etc since she was born. During one such visit recently I spied an abacus. I think they are fantastic instruments. Although I don’t know too much about them. I figured that, as we live in a base ten world, each wire should have nine beads on it. That was 1-9 would be on wire a then ten would be the first one on wire b. However, all the Abaci I have been able to find have ten beads on each wire. Have I misunderstood the use? (Having read up a little it would seem the Romans used them in line with their numeral system, so currently a 9 bead approach would be the natural successor.) I suspect the ten bead per wire has been introduced at somepoint by someone who didn’t realise why there was only 9. If this (9 per wire) isn’t how they were meant to be, then someone’s missed a trick. I want one (9 per wire) for my daughter, and one for school, as I think it could be a really useful tool for teaching place value! The next thing that has been on my mind recently is Pi. (Not pie!) this has been prompted by a friend of mine called Steve who is planning to get Pi to 39 digits (so 38 dp) tattooed on his arm. (If you aren’t aware of the significance of 38 dp, this video explains it well http://www.numberphile.com/videos/pi_universe.html ). He asked me whether I thought he should round to 38 dp or put it as is and dot dot dot, my answer was simple: “we’re mathematicians, not physicists nor engineers, don’t round!” he found it a persuasive argument! This conversation led to me wondering out loud, how many dp do calculators hold Pi to? I assumed it is more than the display, but how much more? This prompted a few trials: His Casio silver holds it to 12dp, His Phone (can’t remember the model) to 8 dp, my phone (Iphone4) to 16dp. 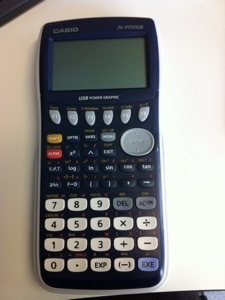 Calculators we had at school: Sharp 13dp and texet 11dp. 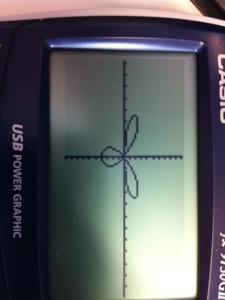 I’d be interested to hear if your phone/calculator hold it any further! We discussed maths tattoos for a while, he knew someone with e^ipi + 1 = 0. We agreed phi = 1 + root 5 all over two would be cool. Graham’s number would be cool. 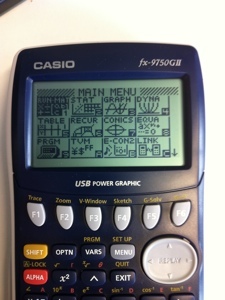 A colleague of mine has a Casio calculator circuit board tattooed on him, which is awesome. Navier-stokes, Euler’s Formula, de Moivre’s theorem were all suggested as possibles maths tattoos! Have you got any? If so I’d love to hear about them, or even just ideas of them would be cool. Well, that just flew by. I can’t believe how fast it went! Christmas seems only a few weeks ago. So what has happened, and what have I learned? I have completed stage one of a project I was involved in with a PE teacher who is one year on from me in terms of his career. The first stage of the project involved each of us observing the other as if it were a formal observation. It was brilliant CPD for both of us. I got to see a PE lesson that I rated as a good with outstanding features. I got to give feedback and discuss the lesson and the grading process with him, got great feedback on my lesson (also graded good with outstanding features) and again had some great discussions about the lesson and the grading process. I was paid a huge complement as part of my feedback when my collegue said: “you ooze pace, but manage to do it in a calm and relaxed manner.” he also noted, “you can tell this is the standard of lesson their used to, and not a one off lesson for observations sake.” This second comment ties in strongly with my philosophy on teaching. I think we owe it to the pupils to give them the best lessons we can, to enable them to meet their potential and succeed on reaching their goals. This has been a common theme for me this term. I have had a number of conversations, sometimes heated, on the subject. We took part in a peer review a few weeks ago where SLT from two other schools came in and along with our own SLT observed a lot of staff. Each department was given three lessons where an observer would be circulating the lesson. In the staffroom after they announced the time slots a colleague said, “that’s alright, I only have to plan two good lessons.” This irked me and I questioned this. I outlined my theory that we should all be trying to be at least good all the time. There was a little argument and a couple of others seemed to take their side, claiming it was impossible given the time to plan good lessons every period. I disagree, and think if the time is running out then you need to work smarter, not harder. A well planned and resources lesson can be tweaked and used again with a different class when the topic is next met. Marking can be kept on top of by implementing smarter working systems and doing a bit at a time, etc. Thankfully though, it seems from other discussions I’ve had that most of my colleagues are in fact in my camp on this one. 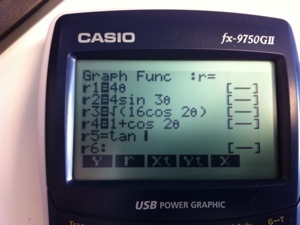 This term saw my first foray into teaching further maths a-level. 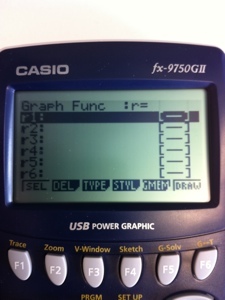 Having finished FP1 and most of FP2 I have really renewed my passion for higher level maths. It has encouraged me to start researching higher maths for fun, this has meant though that maths books and education books are both now ahead of novels in my reading priority list. Reading is something that I have lost time for in general as well. This has been due partly to the hours I work, but mainly the fact I have a young baby at home and I spent all my free time playing with her. I do miss reading a little, but the precious moments I have with my daughter are far more important, after-all, the books will always be there. She will grow up and lead her own life. I am hoping to incorporate more reading time once she has gone to bed during next term though! I have had another PGCE student take some of my lessons this term and have again enjoyed the experience and found that observing others is key to improving myself, be it said PGCE student, or the more senior members of staff I’ve observed. The whole process of helping develop students has been great and I have asked to be considered as a possible mentor (for NQTs; ITT students or even both) next year. All in all, I have enjoyed this term and feel renewed and invigorated by the challenges ahead. The next half term is to be my last with my current classes (We change timetables at spring bank), and the ones I lose next year I will miss. None more than my year elevens, with whom I have built a great relationship. They were the first class I took over at this school, and I will miss them all. I just hope they leave with the best grades they can and go on to achieve all they want in the future! There are also some changes being made to staffing at school. The vice principal is moving on to a headship and a couple of the department are moving to schools closer to home to cut down on their commutes and give then more time with their families. This means next year will be very different. I will miss those leaving, but wish then the best. I do, however, think that it is good to have some changes, if everything stayed the same we may find ourselves complacent, familiar, taking our foot of the gas. We have come a long way in the last two years, but our work is far from over and I know the staff staying are committed to taking the team on to the next level. I am looking forward to seeing what next year brings, for me; the team and the school as a whole! But first, there is the small matter of the summer term and external exams for us to sink our teeth into.